April is BELGIAN BEER MONTH at Toronado, 547 Haight St., San Francisco. 415.863.2276 or http://www.toronado.com for details. Through April 15, 2010. TERENCE BLANCHARD QUINTET performs at Yoshi’s San Francisco. Blanchard, originally from New Orleans, has been active in raising awareness and support for the people of that city since Hurricane Katrina. 8pm. $18. Yoshi’s, 1330 Fillmore St, SF. 415.655.5600 or http://www.yoshis.com for details. April 15-May 2, 2010. CUBACARIBE FESTIVAL OF DANCE AND MUSIC, freaturing master artists from HAITI, New York, NEW ORLEANS and Cuba. Dance Mission Theater, 3316 24th St., San Francisco. $18.50-$22. 415.273.4633 or http://www.cubacaribe.org for details. April 16, 2010. DEBORAH KUHL sings French standards at La Veranda Café in Clayton from 6:30pm to 9:30pm. www.laverandacafe.com or www.deborahkuhl.com for details. April 16-May 2, 2010. THE LITTLE PRINCE. Fringe Festival of Marin presents a 40-minute adaptation of the beloved SAINT-EXUPERY children’s book. Also on the bill are a number of one-acts and monologues. $5-$17. Meadowlands Hall, Dominican University, 50 Acacia Ave., San Rafael. 415.673.3131 or http://www.fringeofmarin.com for details. Friday at Saturday at 7:30pm; Sunday at 2pm. April 17, 2010. SAN FRANCISCO PIANO TRIO. Works by FAURE and more. $10-$25. 8pm. Occidental Community Church, 3621 Church St., Occidental. 707.874.3501 for details. April 20, 2010. SENEGALESE NIGHTINGALE BAABA MAAL performs iin Cal Performances, Zellerbach Hall. A living legend in his native SENEGAL, singer/guitarist Baaba Maal is known as “the Nightingale” for the stunning power of his voice. Honing a unique sound, Maal blends traditional African music with elements of reggae, pop, R&B, soul, mazz, and blues to create dazzling live performances featuring an array of singers, dancers and drummers. Tickets start at $24.510.642.9988 or http://www.calperformances.org for details. 8pm. April 20, 2010. ANDREW CARRIERE & THE ZYDECO/CAJUN ALLSTARS perform Cajun/Zydeco A native of Southern Louisiana, accordionist and singer Andrew Carriere brings a long family tradition into his playing. His father was the legendary Creole fiddler "Bebe" Carriere, his uncle was accordionist Eraste Carriere, and cousins Chubby, Calvin, and Roy Carrier are popular in the zydeco arena. Carriere moved to the Bay Area in the '60s, learned accordion from the late Danny Poullard, and is featured vocalist on the California Cajun Orchestra's "Not Lonesome Anymore" CD. He performs regularly with the Creole Belles and CZ & the Bon Vivants, and more occasionally in the Cajun Classics. Carriere's Zydeco/Cajun Allstars are steel guitarist Billy Wilson, drummer David "Killer" Hymowitz, guitarist Mitch Polzak, fiddler Annie Staninec (a new recruit from the Kathy Kallick country-bluegrass band), and bassist Steven Strauss. The lineup may not seem particularly "traditional" to current followers of Cajun and zydeco, but, Wilson explains, "This is the real tradition that came out of the '50s and '60s honky-tonk Cajun bands, where they just had fun and played for dancers. The steel guitar was right there, and fiddles and an occasional lead guitar." And, of course, the accordion. The repertoire is the standards and classics of Cajun and zydeco, old and new. Doors at 7:30 p.m.; Cajun/Zydeco dance lesson with Diana Castillo at 8:00 p.m.; Show at 8:30 p.m. $10 http://www.ashkenaz.com for details. April 20-24, 2010. BOUQUETS TO ART, in which floral designers from all over the world reinterpret or respond to works that will be shown in the upcoming exhibits BIRTH OF IMPRESSIONISM and VAN GOGH, GAUGUIN, CEZANNE AND BEYOND… Artwork all made out of flowers. De Young, 50 Hagiwara Tea Garden (at JFK, in Golden Gate Park), SF. $20. 415.750.3600 or http://www.deyoungmusem.org for details. April 21-24, 2010. MADELEINE PEYROUX performs at Yoshi’s San Francisco. 1330 Fillmore, SF. 415.655.5600 or http://www.yoshis.com for details. April 23, 2010. DEBORAH KUHL sings French standards at La Veranda Café in Clayton from 6:30pm to 9:30pm. www.laverandacafe.com or www.deborahkuhl.com for details. April 25, 2010. JAI UTTAL sings for a HAITI BENEFIT at Marin Center. World leader in Kirtan sings for Haiti Benefit. Accompanied by Tina Malia and Stephen Kent. Kirtan is the calling, the crying, the reaching across infinite space—and digging into the heart’s deepest well—to touch and be touched by the Divine Presence." Jai Uttal, Grammy nominee and world-music fusion pioneer, has been leading Kirtans worldwide for over 30 years. Uttal’s musical roots embrace a rich variety of cultures and traditions that span the globe and the centuries. His music distills the essence of diverse musical forms. Tina Malia is a Bay Area favorite. Her luxurious voice and enchanting presence are creating a stir from coast to coast and across the world. Her original music is inspired by classical training on the piano and her roots are in American folk and soul music. Multi- instrumentalist and composer Stephen Kent is one of the premier Didgeridoo virtuosos in the contemporary world. A benefit for Haiti relief efforts, proceeds go to AMMA’s Haiti Relief Fund. More information: http://www.embracingtheworld.com. $30 / $50. Come and help support Amma's Haiti Relief Fund to build an orphanage in Laboulle/Port Au Prince Haiti. 6:30pm. Showcase Theater, Marin Center, San Rafael. April 25, 2010. DANCEVERSITY WORLD SHOWCASE presents FAMILY NIGHT FOR HAITI. Dancers of all ages present a world of dance styles in this fundraising evening, a "family night for Haiti" filled with fun activities including face painting and scarf dancing, produced by DanceVersity World Showcase. Money raised goes to the What If? Foundation (www.whatiffoundation.org), a local organization that since 2000 has been helping feed and educate children in the Haitian capital of Port-au-Prince, with a portion also earmarked for the DanceVersity scholarship fund. Live music of the Middle East is provided by Helm. The DanceVersity Ensemble and students perform, along with Hannah Romanowsky; Holly Shaw and the Elixir of Youth Dance Company; Farima Berenji, Emellie Coleman, and members of Ballet Afsaneh; and bellydancers Lisa Tilton and Gail Corrado. Vicki Virk of Dholrhythms Dance Company gives a bhangra dance lesson, followed by a performance by Dholrhythms. DanceVersity was created by Hannah Romanowsky and runs classes at several locations, including Ashkenaz. Its mission is to promote a positive experience of different cultures at a formative age through an innovative curriculum of multicultural dance, music, costuming, folklore, and cultural studies. Romanowsky is a classically trained, international performing artist with a degree from San Francisco State University in Dance Ethnology and World Music. She is an artist, educator, and student dedicated to the enchanting dance traditions of North Africa, the Middle East, and Central Asia, and finds deep meaning in sharing these beautiful traditions with others through performance and instruction. Doors at 6:00 p.m.; Show at 6:30 p.m. $10-$20 sliding scale / $5-$10 children 12 & under.www.danceversity.com or http://www.ashkenaz.com for details. April 30, 2010. 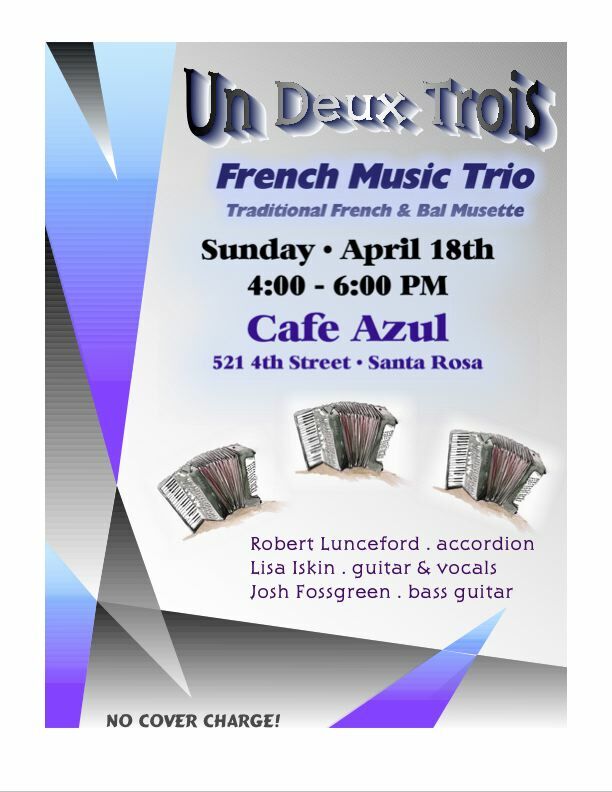 DEBORAH KUHL sings French standards at La Veranda Café in Clayton from 6:30pm to 9:30pm. www.laverandacafe.com or www.deborahkuhl.com for details. UN PROPHETE / A PROPHET. Opera Plaza, SF; Shattuck, Berkeley. May 14, 2010. CHOCOLAT A LA FRANÇAISE, OR, A ROMP THROUGH FRANCE’S PASSION FOR CHOCOLATE. Talk given by Suzanne Toczyski. Chamson (The Chambolle-Musigny / Sonoma Alliance). Trinity Episcopal Church, Sonoma. 7:30pm.